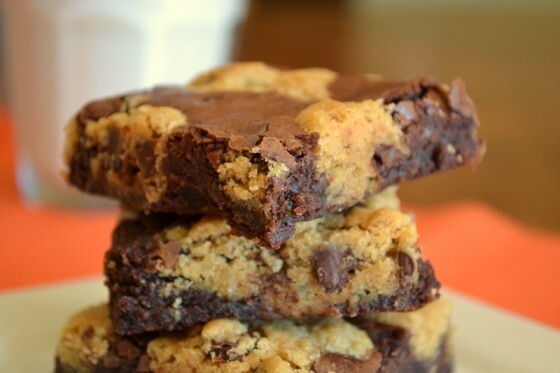 It’s fairly simple – just take 2 box brownie mixes, put them into a jelly roll pan, drop spoonfuls of chocolate chip cookie dough over the top, bake it, let it cool, and then share! If you like this recipe, you may like this one or this one too! And don’t forget to use Pan Goop! If you could combine two of your favorite desserts, what would they be? Great recipe to serve for a crowd! 2. Spray jelly roll pan with nonstick spray or apply Pan Goop. 3. Prepare brownie mixes according to the package. 4. 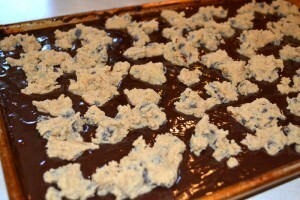 Pour brownie mix into jelly roll pan. 5. Prepare cookie mix according to package. 6. 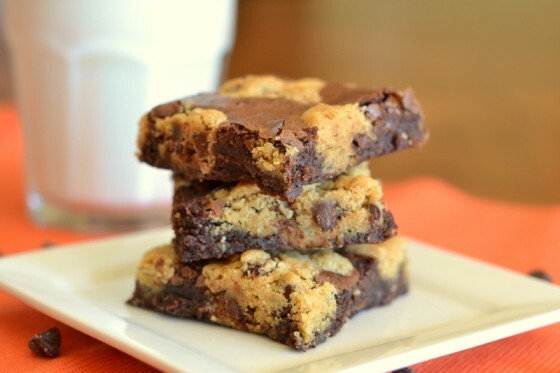 Drop cookie dough by the spoonfuls over top the brownie batter. 7. 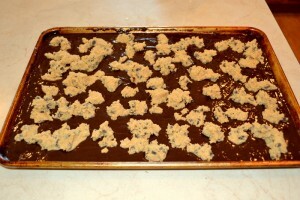 Bake until brownie is done, about 20 – 22 minutes depending on your oven. 8. Let cool. Cut. Serve. Store in an airtight container for up to one week or freeze and bring it out when you need them. Just linked it up Nicky. Thanks for stopping by and this recipe won’t disappoint!